Read the original article from the Clemson University Newsroom at this link! Click on this image to read the S.C. Wind Energy Supply Chain Survey and Offshore Wind Economic Impact Study referred to in the article. CLEMSON — A wind farm off South Carolina’s coast could generate thousands of jobs and millions of dollars in wages and state and local government revenues, a Clemson University study says. 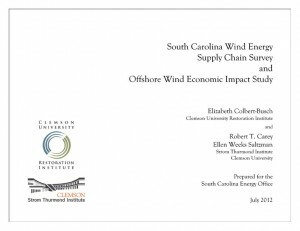 A report by Clemson University’s Restoration Institute and Strom Thurmond Institute of Government and Public Affairs details the extent of South Carolina’s wind-energy industry in 2012 and illustrates how the state’s financial landscape could look after development of an offshore wind farm. The report, S.C. Wind Energy Supply Chain Survey and Offshore Wind Economic Impact Study, prepared for the S.C. Energy Office, shows that a 1,000-megawatt offshore wind farm constructed between 2016 and 2025 would create an average of more than 3,800 jobs per year throughout the 10-year construction period. It also would generate nearly $2 billion in wages and nearly $620 million in combined state and local government revenue, the study says. Ashlie Lancaster, director of the S.C. Energy Office, said that while South Carolina currently has no utility-scale offshore wind-energy generation capacity, the state already plays an important role in the nation’s wind-energy supply chain. Development of such an industry would only bolster the state’s position nationally and internationally, Lancaster said. “Not only would an offshore wind industry help diversify South Carolina’s energy sources, it also would have the potential to generate thousands of long-term jobs and create a sustainable industry that could become the envy of the nation,” she said. The S.C. Wind Industry census states 33 firms that responded to the survey reported a total of 1,134 employees spend part or all of their time on wind energy-related production or services. These employees represent about 14 percent of total employment at these firms. Survey respondents reported South Carolina wind-energy employees in management, professional, scientific and technical jobs made an average of $78,308 per year, which is slightly above the state’s average annual salary for these types of jobs of $62,406. S.C. Secretary of Commerce Bobby Hitt said it is vital South Carolina continues to look to industry and research collaborations to fill the needs of the marketplace and keep the state competitive. An important component of Clemson’s role in development of an offshore wind industry is workforce development, said John Kelly, vice president for economic development. Through collaboration with private industry partner, and certificate and advanced-degree education programs, Clemson will help train the state’s future workforce, Kelly said. “Part of Clemson’s role in our growing wind industry will be to provide a talent pool that allows our companies to innovate and be competitive in the marketplace,” Kelly said. Through development of the Zucker Family Graduate Education Center at the Clemson University’s Restoration Institute and creation last year of the Center for Workforce Development, Clemson’s goal is to keep students in-state through college and provide the jobs they seek after they graduate, he said. “South Carolina has access to all the components an offshore wind industry needs,” Kelly said.